Here's the deal Oppo. I'm currently in the process of preparing a short description of the vehicle you see above and I thought I'd give you something to do in the meantime. Your task is to guess what that car is. I'm going to give you an hour or so (depending on when I have some free time) and after that edit in the proper information. The FSR Tarpan (FSR stands for Fabryka Samochodów Rolniczych - Farming Car Factory, Tarpan is a breed of horse) was a Polish attempt at creating a simple yet reliable car meant to satisfy farmers' needs. 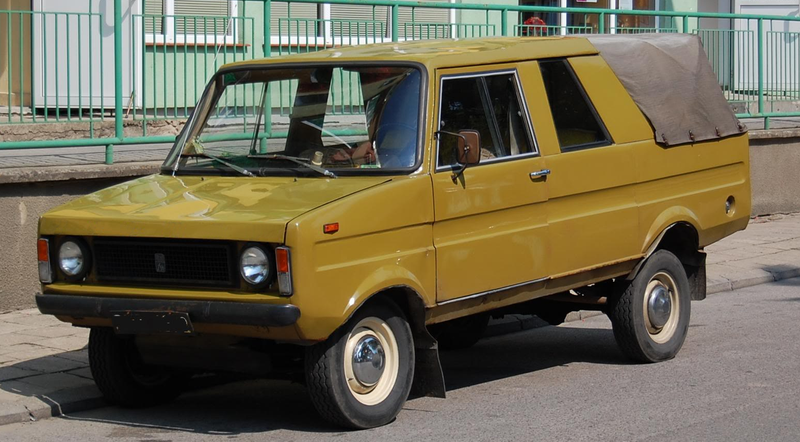 Released in 1973, it was initially available as a pick-up (like the one you see above) and a wagon called kombi, both with 3 or 6 seats. The car's specification wasn't very impressive. It was initially available with 2 flathead 2.1l I4 petrol engines, one producing 50 hp and 122 NM (M-20) and the other making 70 hp and 144 NM of torque. Later, a 1.5l OHV rated at 75 hp joined the range, followed by 2 2.5 diesels, one with 4, and one with 3 pots. All versions featured rear wheel drive with an optional locking differential, with power transmitted thorough 3 (initially) and 4 speed manual gearboxes. The tarpan featured an interesting innovation. The rear wall that separated the cabin from the cargo space was moveable. This way the driver could choose between being able to carry 6 passengers or fold the rear bench and move the wall forward to enlarge the loading space. The Tarpan could carry up to 600kg of cargo with 3 people on board. According to a 1987 review of a diesel version, it was very spacious and relatively comfortable (although loud), handled better than expected (especially after front coil springs had been replaced with leaf springs) and had superb fuel economy. They also praised the high clearance and a relatively low loading bay (at 0,7m) for a car of this sort. They criticized the brakes (4 drums), the uncomfortable positioning of the shifter, the racket from the naturally aspirated diesel and the dodgy rear axle design. Currently, Tarpan's legacy is continued by a semi-military car called Honker; but that's a topic for a different post. In the end I'd like to ask you if you'd like for me to make "Obscure cars" a semi-regular feature. Share your opinions and comments.